Karinkunnam 6S Malayalam movie satellite rights brought by surya tv. Karinkunnam Sixes is the latest movie of director deepu karunakaran after fireman. Karinkunnam Sixes is a malayalam sports movie, this genre is very rare in mollywood. 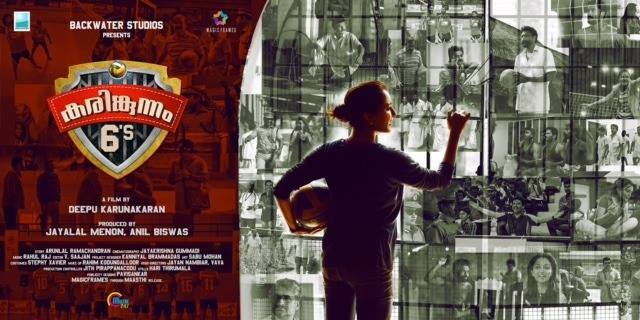 Manju Warrier and Anoop Menon are doing leading roles in this movie. there is a wide range of star cast in this film. Babu Antony, Suraj Venjaramoodu, Baiju, Padmaraj Ratheesh, Sudev Nair, Sudheer Karamana, Jacob Gregory, Santhosh Keezhattoor, Maniyanpilla Raju, Noby, Suraj Venjaramoodu are in the star cast. Popular directors Shyamaprasad and Major Ravi are appearing in this film. Arunlal Ramachandran is the writer of Karinkunnam 6S Malayalam Movie. Vettah is the recent film by Arunlal Ramachandran and he is first time working with Deepu Karunakaran. Rahul Raj is composing the music of this sports movie. Karinkunnam Sixes is scheduled to release on 7th July 2016. Kasaba, Paava are the other films releasing on this day. Anil Biswas and Jayalal Menon are the producers of this film under the banner Backwater Studios. Surya TV recently purchased some films, we will update more film rights here. Happy wedding, Kasaba, Paava, Shajahanum Pareekkuttiyum, Anuraga Karikkin Vellam etc are some of the recent releases. Crazy Gopalan was the debut movie of Deepu karunakaran. Winter, Teja Bhai & Family, Fireman are the other films from this director. Satellite rights of latest malayalam films 2016 will update keralatv.in. Stay tuned her for all the latest updates of malayalam television channels.